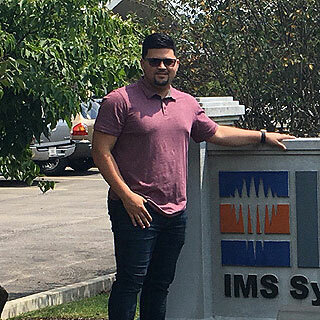 Alumni Profile: Angel Melendez '17, Service Engineer for IMS Systems, Inc.
"Angel is a very competent new service engineer. He has become an integral part of our service team. I selected him for the position based on the academic reputation of Point Park University and for his electrical engineering experience." David W. Lohr, Service Manager North American Operation, IMS Systems, Inc.
"Point Park offered me a baseball scholarship, the campus is located in the heart of the City of Pittsburgh and the University has a good science and engineering department. How did you land your engineering position soon after graduation? After graduating in April, I went on vacation with my family to Toronto, Canada. Two weeks after my vacation, Clifton Associates Inc., a recruiting company, informed me about an opportunity in the service department for IMS Systems, Inc.
IMS was looking to hire a new service engineer and thought my profile fit perfectly with their requirements. Clifton Associates arranged an interview for me with the general manager and the service manager. Thank God everything went well and I started working for IMS in June. What factors made you choose Point Park University? It was an easy choice for me. Point Park offered me a baseball scholarship, the campus is located in the heart of the City of Pittsburgh and the University has a good science and engineering department. How have Point Park's engineering faculty and classes helped you in your career so far? Dr. Gregg Johnson, who always helped me to find the classes I needed and made sure they did not interfere with my baseball practice hours. Also, he helped me take the right classes to finish my minor in mathematics. As a whole, the NSET department at Point Park University provided me with the knowledge and tools to become a good electrical engineer. What's your favorite Point Park memory? My favorite memory at Point Park was working with my senior class capstone group for our final project. It was a great experience for me. We learned a lot from it and at the end, we got to build a tri-power source portable charger. What are your career goals? My career goals are to earn a master's degree and get my Professional Engineering License.